We are happy to announce that two bids have been submitted in time for organisation of the 2nd European Universities Games 2014. European Universities Games present the largest European multisport student event, licesed by the European University Sports Association (EUSA) and featuring 10 sports. Eight of those are compulsory: Basketball, Football, Futsal, Handball, Volleyball, Badminton, Tennis and Table Tennis, with the organisers chosing two optional sports: Beach-Volleyball, Golf, Rowing or Rugby 7’s. 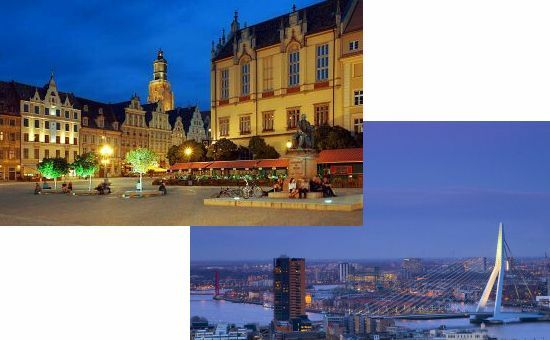 The two bidding cities Rotterdam, the Netherlands and Wroclaw, Poland have submitted the bidding documents and paid the bidding fee within the published deadline, which was yesterday - September 1, 2011. EUSA will be carrying out the evaluation visits of candidate cities in the month of October 2011. The Games will be attributed after the presentation of the bids at the Executive Committee Meeting on November 26, 2011 in Cordoba, Spain. The 1st European Universities Games will be held next year in Cordoba, Spain between July 13 and 24. Details at www.eusagames2012.com.